Over in the macro forum, I have been posting some pictures of the relatively large head capsule shed by a mature (5th instar?) larva of a fritillary butterfly (genus Speyeria). What's shown here is the relatively small head capsule shed by a 1st instar larva of the same brood. This capsule formed inside the butterfly's egg and was used by the freshly hatched caterpillar until its first molt, at which time the caterpillar simply grew a new head capsule and cast off this one along with its old too-small skin. I was interested to notice that the bristles of this 1st instar larva are obviously barbed. The much larger bristles of the 5th instar head capsule appear to be smooth when viewed at correspondingly lower magnification. 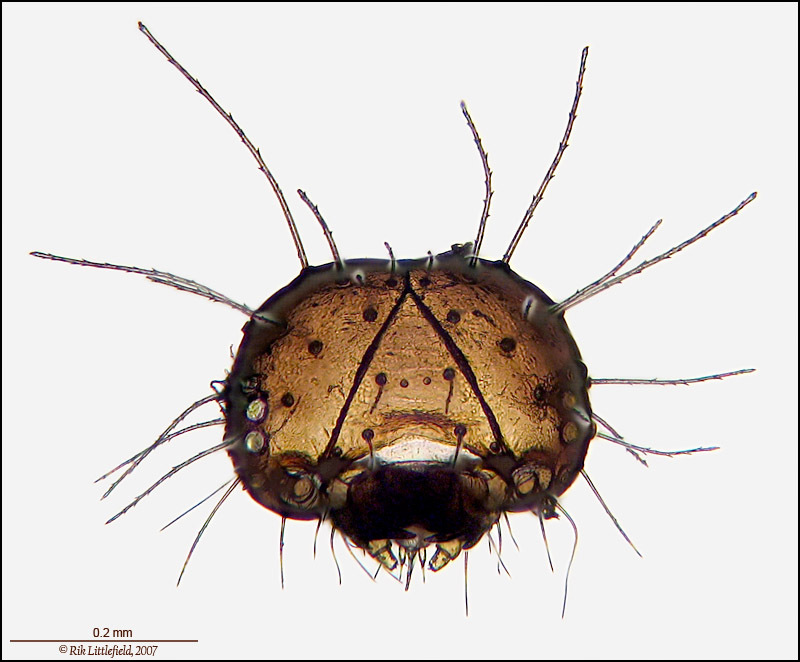 However, when examined at the same magnification as shown here, the 5th instar bristles appear to be barbed also, with the size and number of barbs apparently not much changed from 1st instar. (This is a casual observation; I have not studied carefully.) Many bristles on insects have a sensory function. I do not know what function the barbs serve. Two large light spots on the left side of the head capsule are thin membranes that used to cover lateral ocelli. Similar membranes appear over all the other ocelli (on both sides), but they are shadowed and appear dark in this particular orientation. The light halos around some bristles are artifacts of the stacking procedure. Often I do some manual stacking to remove artifacts like these, but in this case they struck me as helpful by delineating bristles that would otherwise be almost invisible. Technical: Canon SD700IS point-and-shoot through 10X eyepiece, 10X NA 0.25 achromat objective, brightfield illumination, background pushed to uniform light gray in Photoshop postprocessing. 73 frames stacked by Helicon Focus, total depth about 0.2 mm, subject just barely restrained under cover slip elevated by vaseline on corners. The translucence of the capsule makes it a perfect subject for brightfield. All too often insect "parts" are too opaque without some additional preparation. So does this mean we'll see more microscope shots in the future? Excellent brightfield shot Rik. ... So does this mean we'll see more microscope shots in the future? Thanks, Charlie. Not in the near future, I'm afraid. I have to go back to work at the lab tomorrow, and next Monday I start teaching again too, so for the next few months there's not going to be a lot of time for photography. Of course, that busy schedule does have some upsides, depending on your point of view, of course! As usual Rik, an interesting subject, well done. Thank you too for the informative commentary and extended technical notes. Much appreciated. About the technical info, well, I'm likely to want it later so I have to write it down somewhere or for sure I'll forget it by the next day if not sooner. Putting it in the post makes it easy for me to find, and makes it available to everybody else too. Glad to hear that somebody finds it helpful! And I thought I was the only one using postings as a memory record.